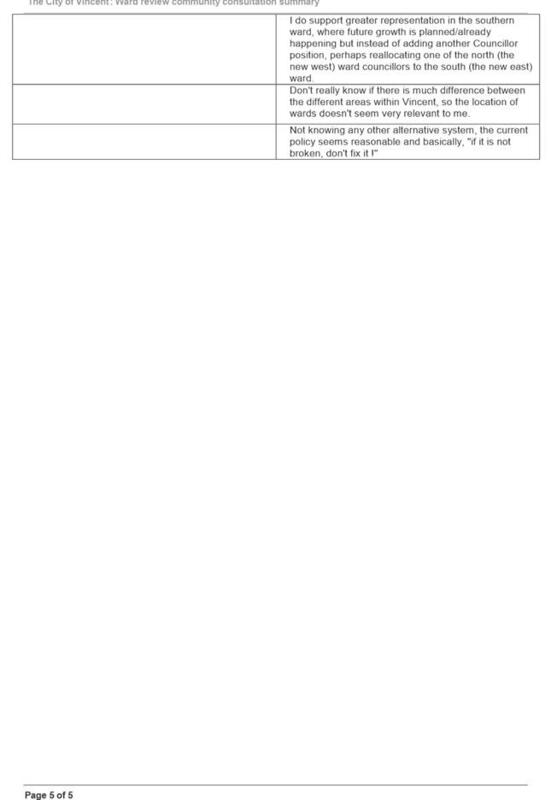 The purpose of this report is to advise the Council of the items approved under delegated authority for the period 12 December 2018 to 28 January 2019.
d. a Register of Items Approved under this Delegated Authority being kept and made available for public inspection on the City’s website during the period that the delegation applies. 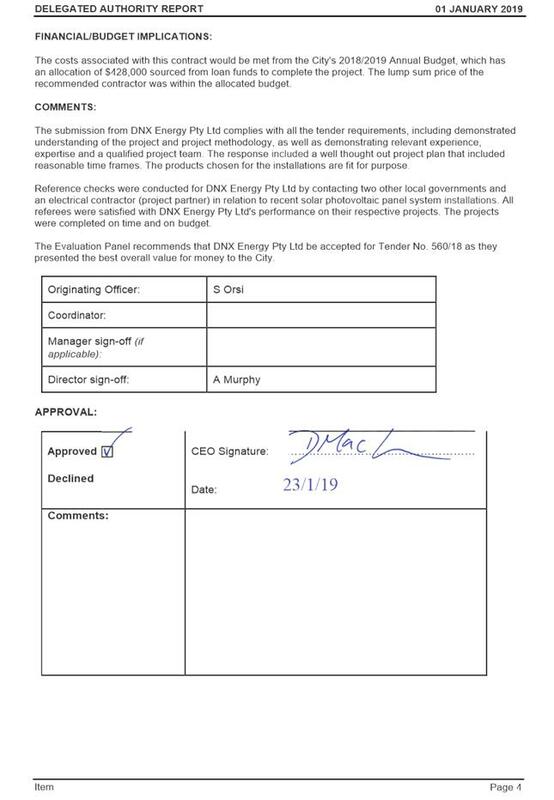 That Council accepts the tender submitted by DNX Energy Pty Ltd for Tender No. 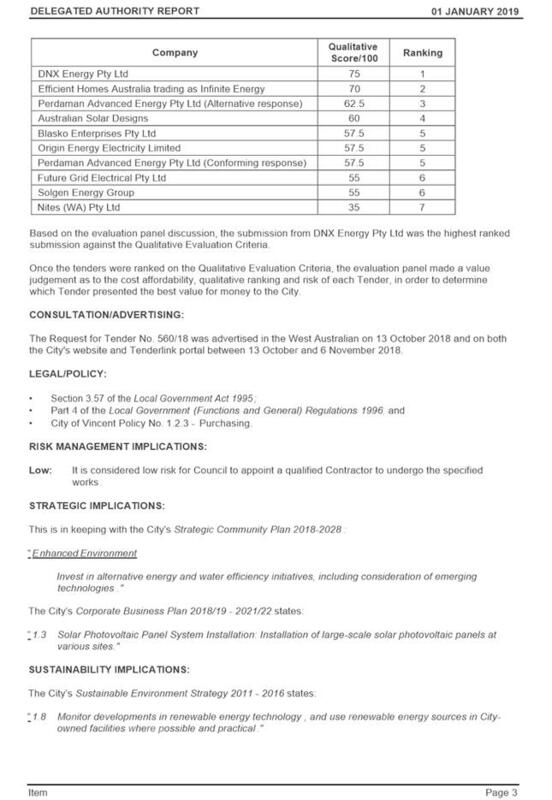 560/18 for the Design, Supply and Installation of Rooftop Photovoltaic Systems for Four City of Vincent Facilities. This report was circulated to Council Members and displayed on the City’s website for a period of three business days, commencing on 17 January 2019. The City received no requests from Council Members for the report to be called in to be considered at the 5 February 2019 Council Meeting. On this basis, and following appropriate due diligence, the Chief Executive Officer authorised the report under delegated authority on 23 January 2019. 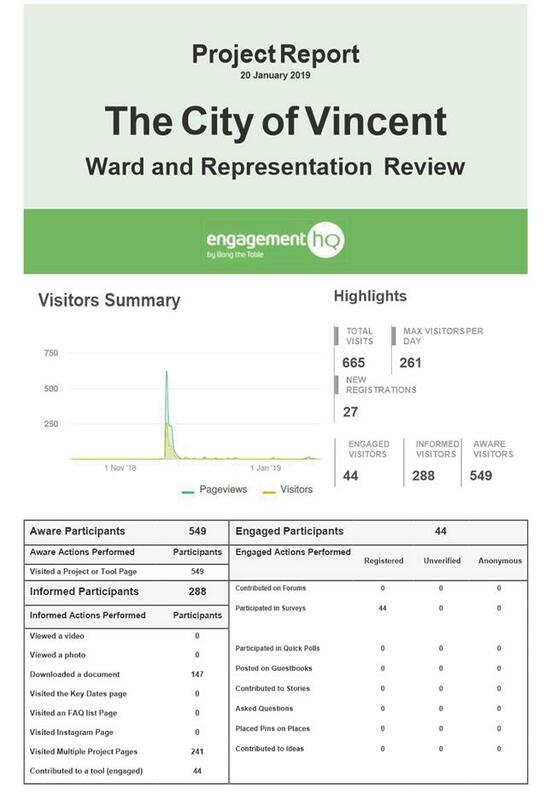 The delegated authority report was displayed on the City’s Website and provided to Council Members for three business days, in accordance with recommendation 1(a) of Council’s resolution above. Matters requiring an absolute or special majority decision of the Council cannot be approved under delegated authority. Low: It is a statutory requirement to report matters approved under delegated authority to the Council. 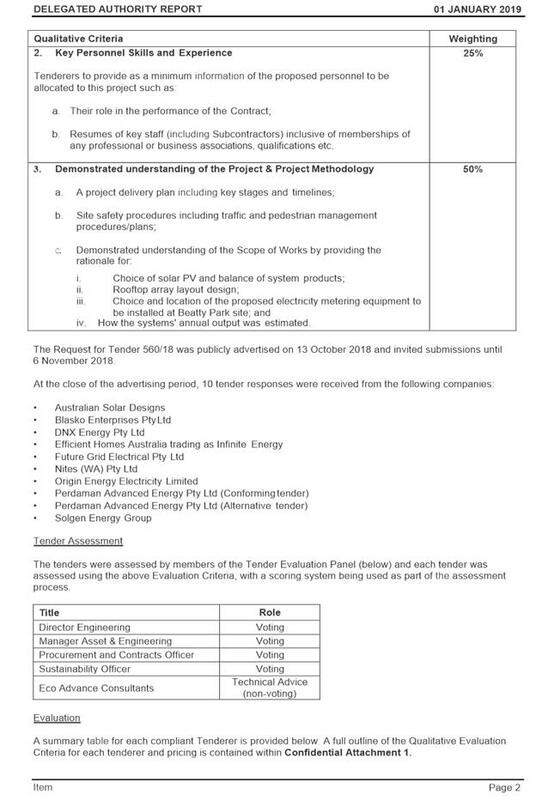 The project to which this tender relates was approved in the City’s 2018/19 Budget. 1. 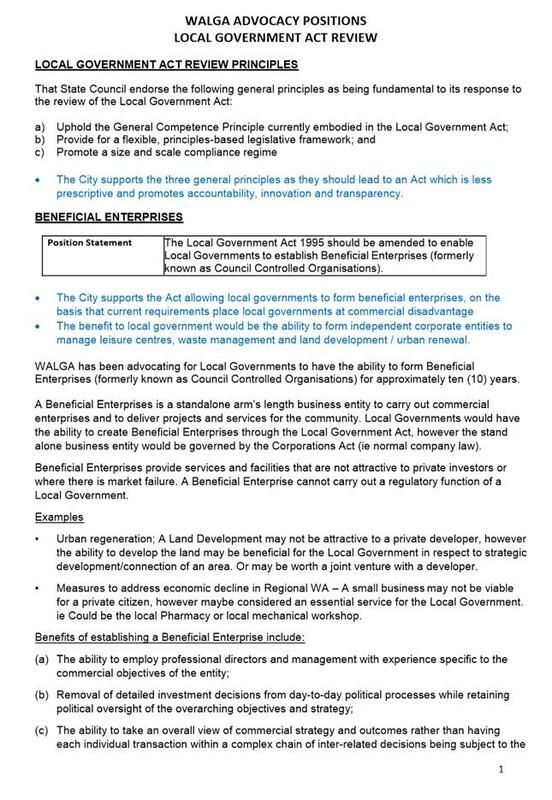 ENDORSES the City’s submission to the West Australian Local Government Association (WALGA) in respect to the Local Government Act review (phase 2) as attached at Attachment 1. 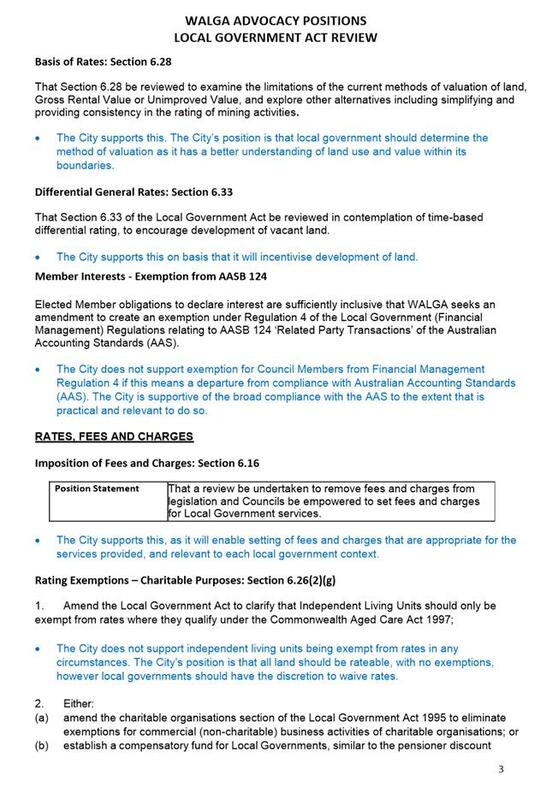 To consider the City’s proposed comments in respect to WALGA’s advocacy positions on the Local Government Act review (phase 2). The Department of Local Government, Sport and Cultural Industries (Department) is currently working on the review of the Local Government Act 1995 (Act). This review was initiated by the state government in 2017 with the intent to create a new, modern Act which empowers local governments to better deliver for the community and be agile, smart and inclusive. · Simplification of the gift disclosure framework. 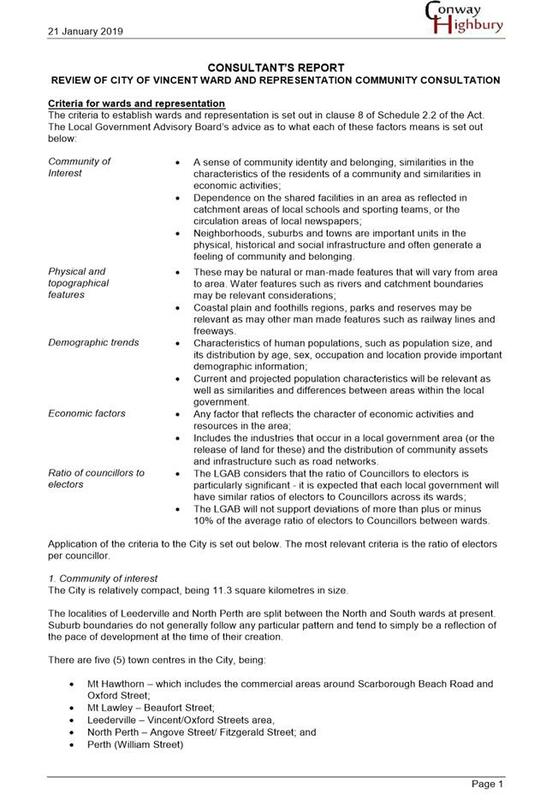 The Department is now inviting local governments and the community to comment on the proposed reform areas, as set out below. This is phase 2 of the review. 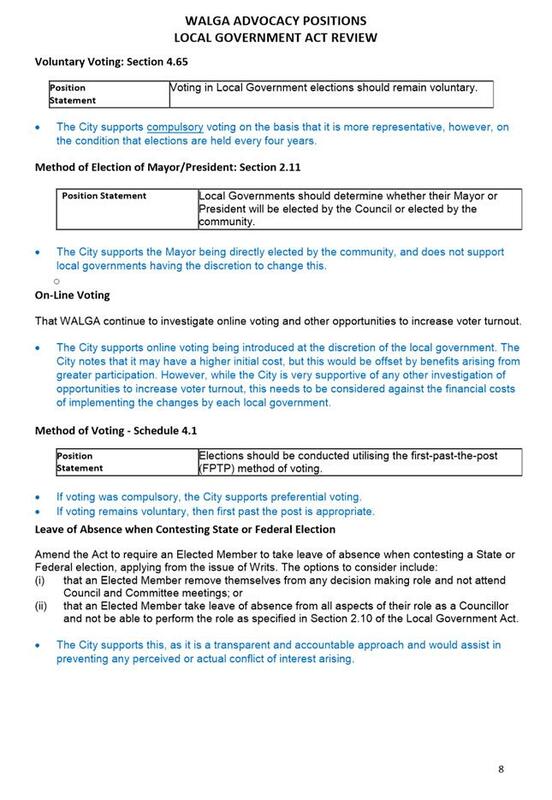 WALGA has prepared an ‘advocacy positions’ paper to be presented to the Department, and has invited local governments to provide comments in respect to the advocacy positions. Comments are required to be provided to WALGA by 22 February 2019. Administration believes that commenting on WALGA’s ‘advocacy positions’ paper is an effective means of providing comments to the Department as part of the phase 2 review process. 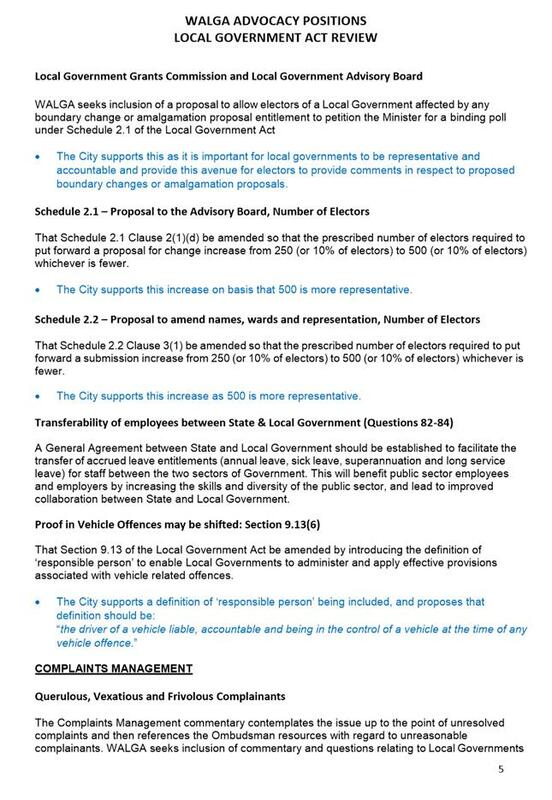 Administration has included its comments in blue in WALGA’s ‘advocacy positions’ paper, as provided at Attachment 1. 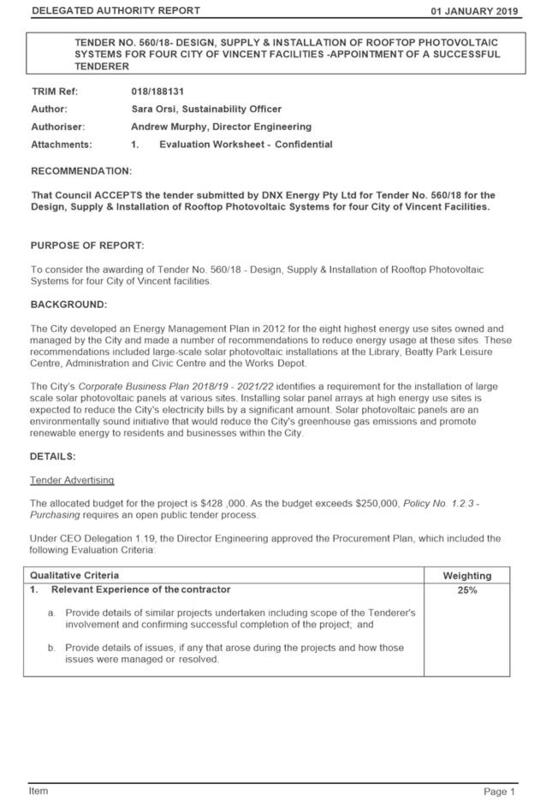 Administration circulated its proposed comments to Council Members in January 2019. The review relates to the Local Government Act 1995 and associated regulations. 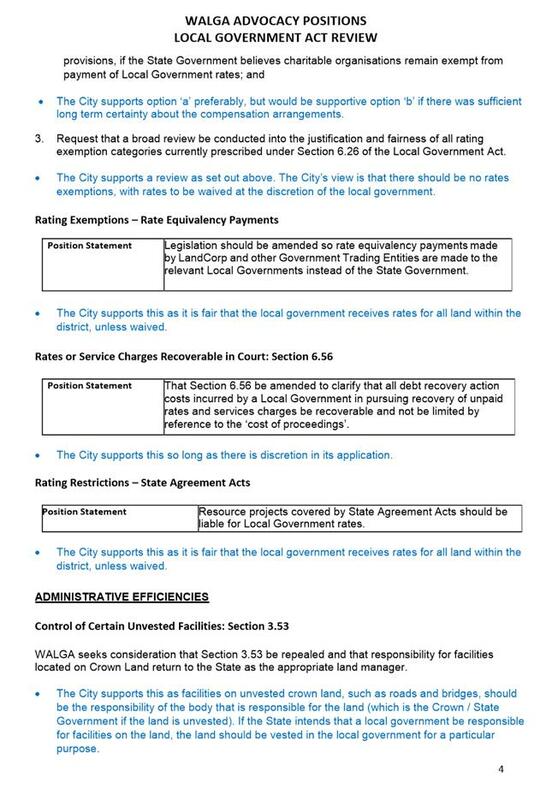 Low: Commenting on WALGA’s ‘advocacy positions’ paper is an effective means of the City providing comments as part of the phase 2 review process. 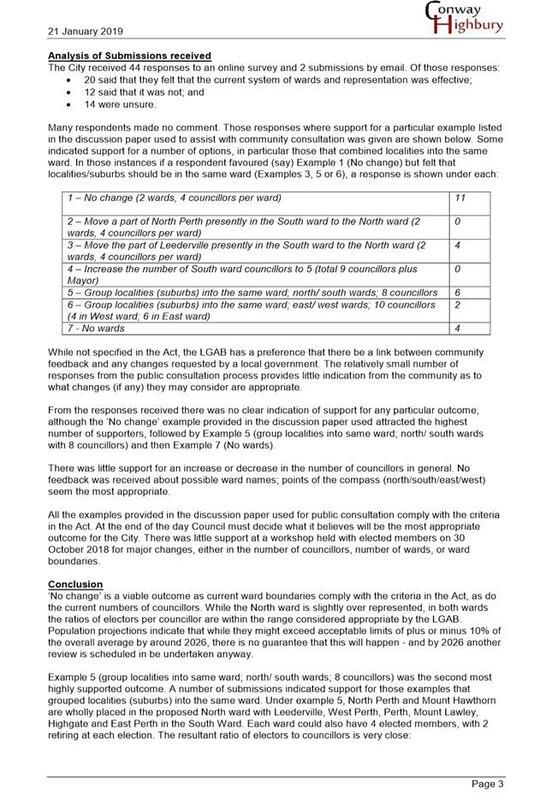 To provide detail on the submissions received in response to the local public notice of the City’s ward and representation review, and to assist in determining whether any changes to wards and representation should be recommended to the Local Government Advisory Board (LGAB). 1. 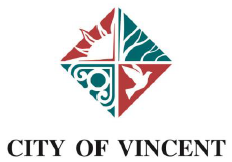 NOTES that eight years has elapsed since the City of Vincent last undertook a review of its ward boundaries and ward representation, and therefore in accordance with clause 6.1 of Schedule 2.2 of the Local Government Act 1995 the City is required to undertake a review this calendar year. prior to undertaking the review as set out in 1. above. Example 1 – no change (two wards, four councillors per ward). Ward boundaries and representation could simply remain as they are. 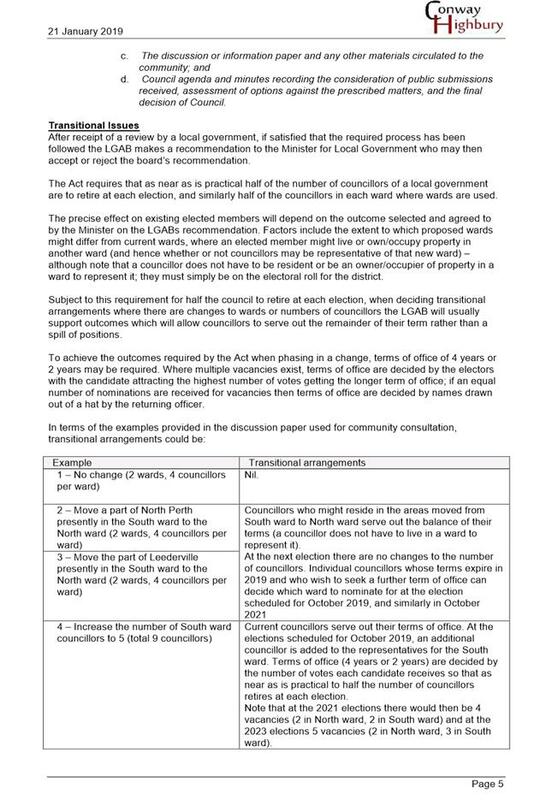 Ratios of electors to councillors are reasonably close, and therefore it is not necessary for any changes to the wards or representation. The boundary between the two possible wards is along Bourke St as at present, but with the area of North Perth and Mt Lawley north of Alma Rd moved to North ward. 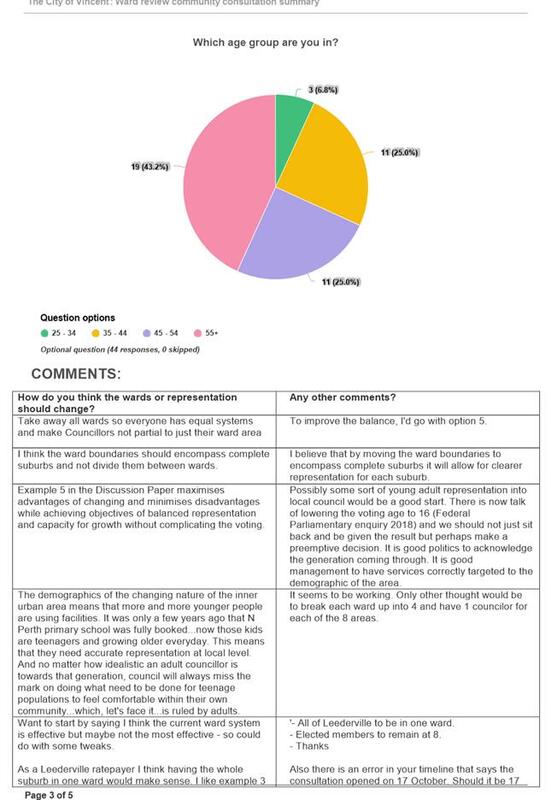 Although within allowable tolerances, the present ratio of councillors to electors shows a slight over representation of the North ward and slight under representation of the South ward. This could be improved by moving the part of Leederville presently in the South ward to the North ward. Current wards and boundaries are maintained, but the slight under representation of the South ward improved by adding a councillor to it. Eight councillors and two wards are maintained. North Perth and Mount Hawthorn are placed in one ward, with Leederville, West Perth, Perth, Mount Lawley, Highgate and East Perth the other. Under this example, the City is divided into two wards along east/west lines with whole localities in each ward. Mount Hawthorn, Leederville and West Perth form a west ward, with North Perth, Mount Lawley, Highgate, Perth and East Perth forming an east ward. 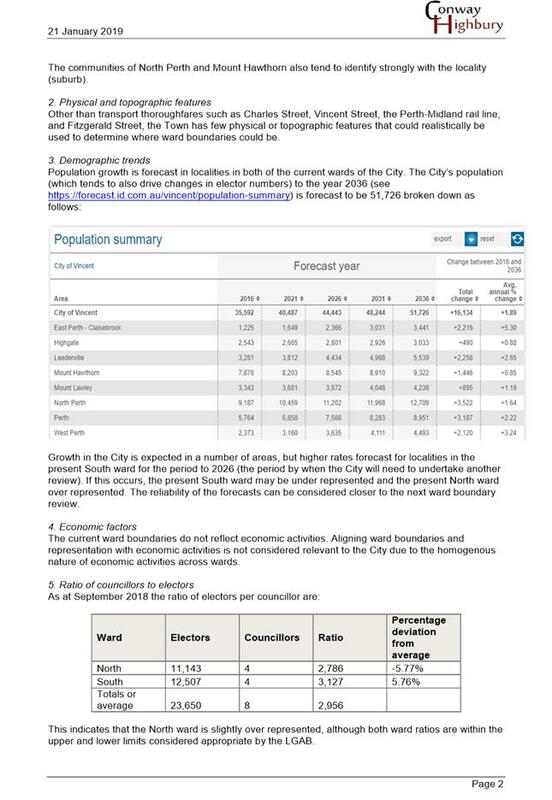 In order to achieve as equal as possible ratio of electors per councillor, it is necessary to have an uneven number of councillors per ward, with the possible East ward having 6 councillors and West ward would have four. Wards are dispensed with altogether. The only variable would be the number of councillors, which are set under the Local Government Act 1995 and can range from 6 to 14. · Public notice advertisement included in the October and November City e-newsletter. The deadline for submissions was 9am on Saturday 19 January 2019. The City received 44 online submissions and two emailed submissions, as detailed in Attachment 1. Conway Highbury, on behalf of the City, reviewed the submissions and considered the criteria for making changes to wards or representation as set out in clause 8 of Schedule 2.2 to the Local Government Act 1995. 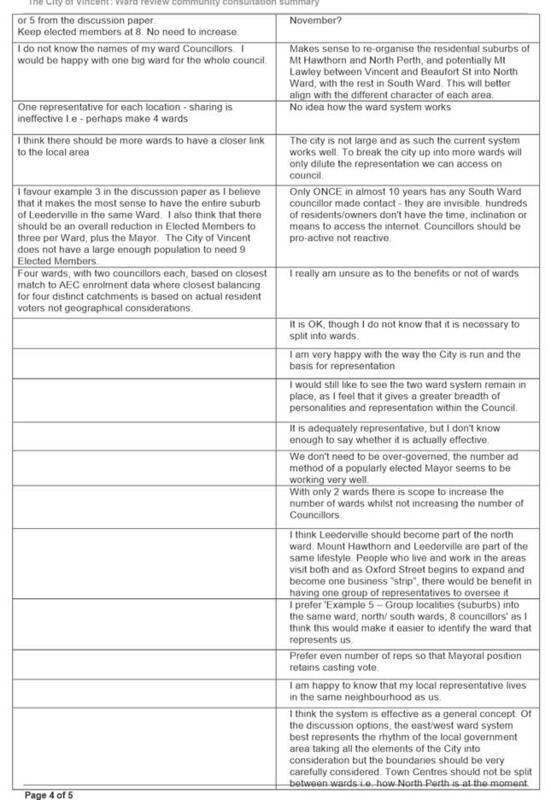 The report attached at Attachment 2 details the submissions and assessment criteria and recommends that no changes to the City’s current ward and representation system are required. 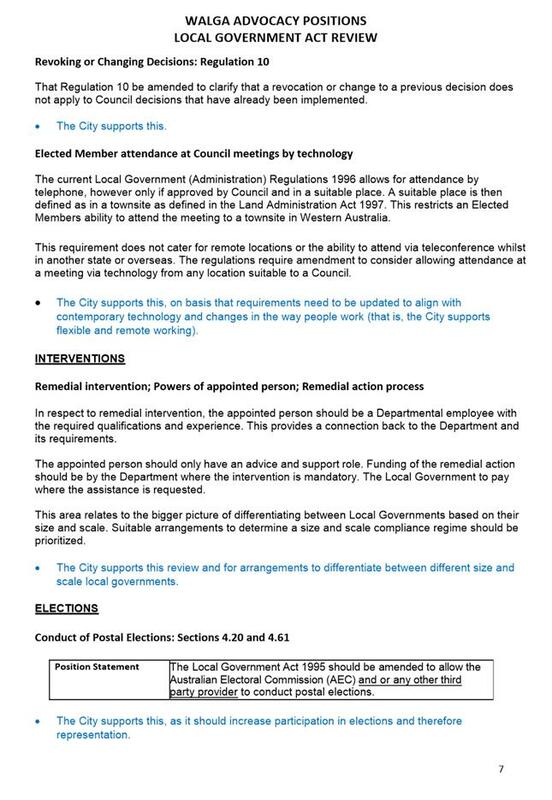 Section 2.2 and schedule 2.2 of the Local Government Act 1995 set out the requirements for local government wards and representation and the review process. 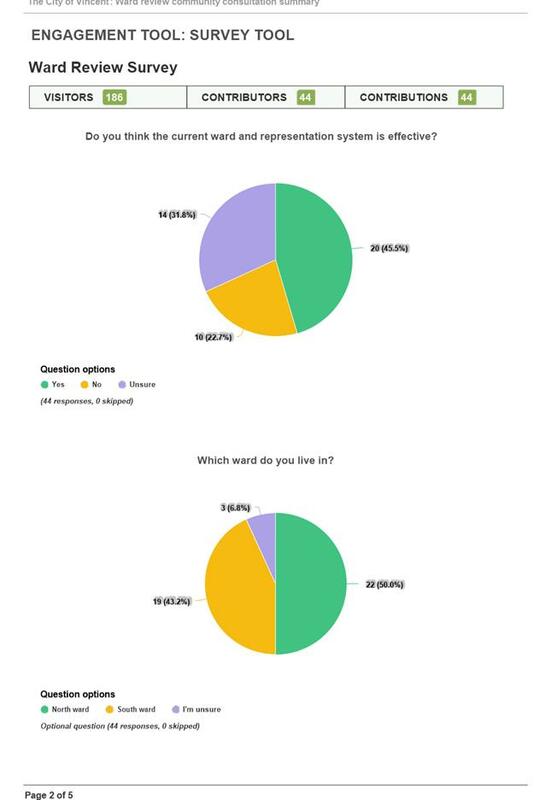 The City’s Community Consultation Policy No. 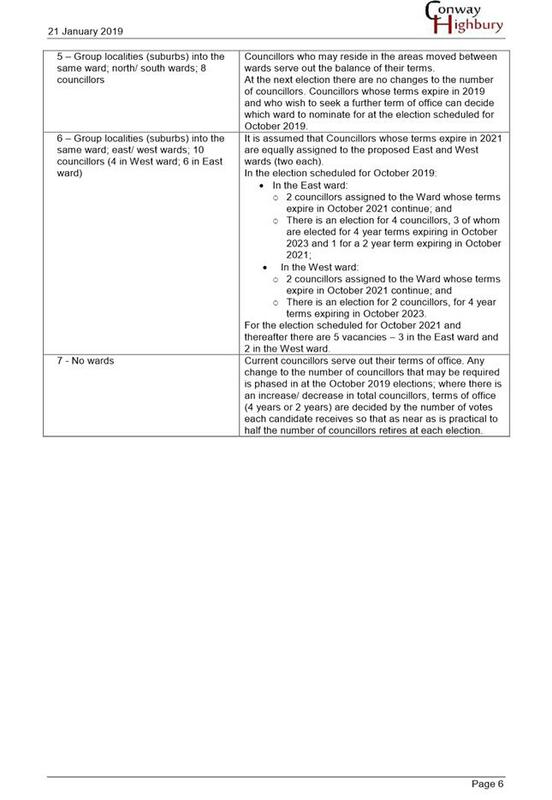 4.1.5 Appendix 1 includes additional consultation requirements for a ward review. Administration complied with the statutory and policy public notice requirements by providing public notice as detailed above. Low Risk The City is required by statute to initiate this review in 2018 and to provide notice of the outcome of the review to the LGAB in 2019 (prior to 31 January 2019 in order for any changes to be implemented prior to the 2019 elections). 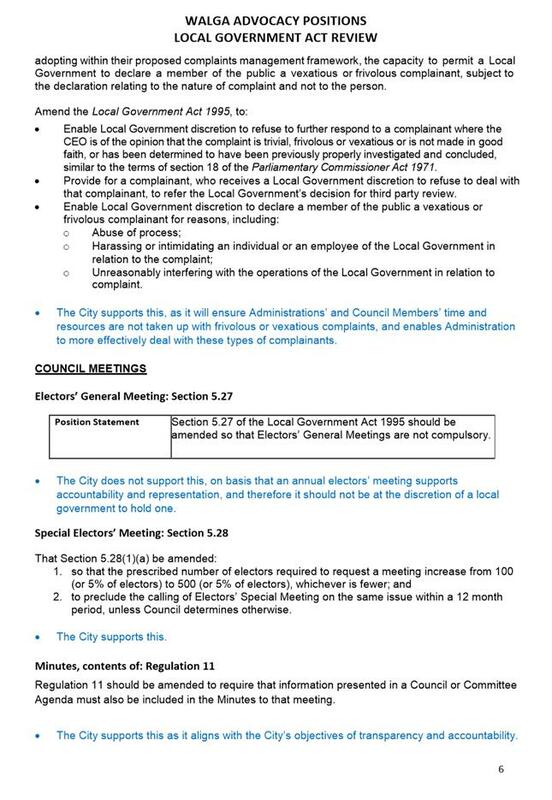 The City will not meet the 31 January 2019 deadline, but the LGAB has confirmed that if it is advised of the outcome of the review by mid-February 2019 changes, if any, will be implemented prior to the local government elections scheduled for October 2019. The review is also in keeping with the City’s Strategic Community Plan 2018-2028 ‘connected community’ and ‘innovative and accountable’ objectives. The City has allocated $20,000 towards this review in its 2018/19 budget. The City has engaged Conway Highbury to conduct the review on the City’s behalf for a fee of approximately $6,000 including GST. The City has also incurred costs of approximately $2,700 as part of the community consultation process. It is estimated that the total cost of the review will be within the allocated $20,000. To consider endorsing a Memorandum of Understanding (MOU) between the Cities of Perth, South Perth, Subiaco, Vincent and the Town of Victoria Park. A meeting of the Inner City Mayors was held on 13 September 2018. The meeting was attended by the Chair Commissioner from the City of Perth, Mayors from the Cities of South Perth, Subiaco and Vincent and the Mayor from the Town of Victoria Park. The meeting was convened to explore opportunities for regional collaboration on strategic issues impacting on local government. An outcome from this meeting was a suggestion that a MOU be developed to define the role and expectations from the group. A draft MOU was prepared and circulated to the parties for discussion at a subsequent meeting of the group, including the respective Chief Executive Officers to be held on 12 December 2018. 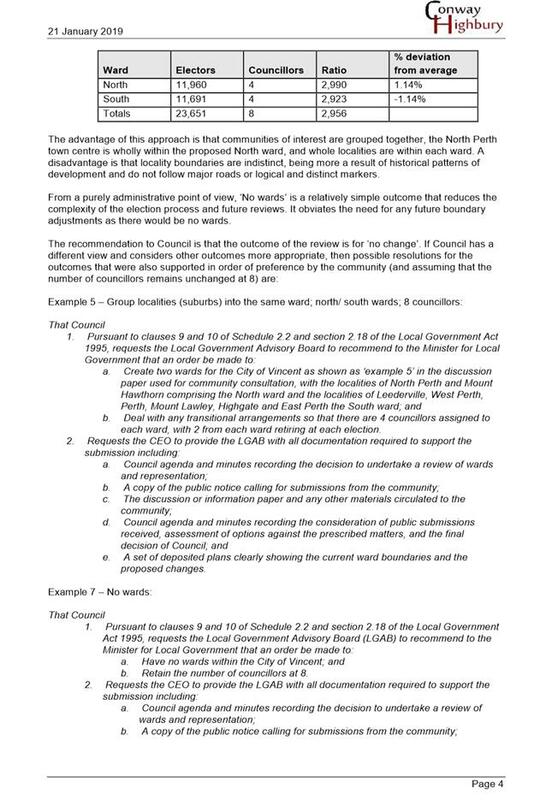 As a result of the discussion, minor amendments were proposed and a subsequent draft MOU circulated (see Attachment 1). The draft MOU proposes to set out “the framework for the establishment of a co-operative relationship between the parties”. The overall intent and draft text of the MOU is sound and presents a valuable opportunity for collaboration between the inner city councils. In the event that it is proposed to proceed with an activity or project that warranted entering into an agreement, that agreement would need to be endorsed through the appropriate process. The draft MOU is proposed to be submitted to each of the participant Councils during February 2019 for formal consideration and endorsement. 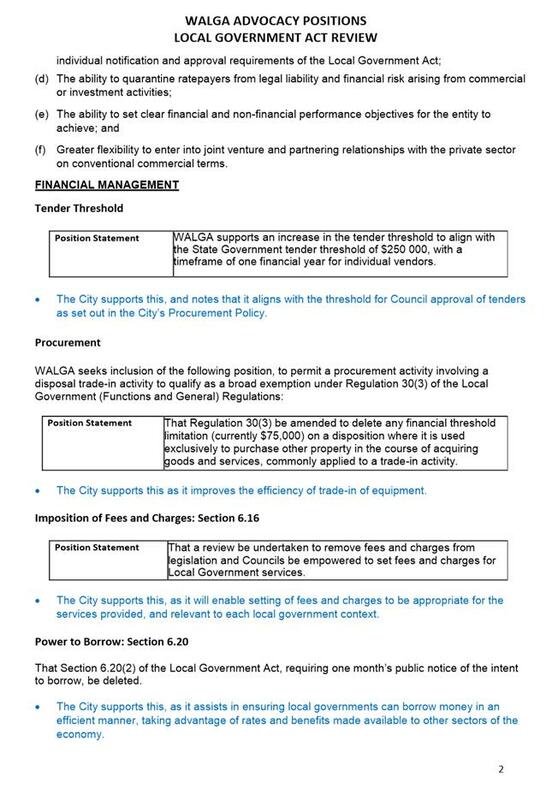 We recommend Council approves in principle the draft MOU and authorises the Mayor and CEO to finalise the text for signature by the Mayor on behalf of Council. The MOU is legally non-binding and does not commit the City to any particular liability or position. There are no legislative or policy positions requiring consideration. The nature of the issues likely to be addressed through the MOU could align with all of the priorities identified in the City’s 2018 – 2028 Strategic Community Plan and many of the defined outcomes our community expects us to achieve. There are no financial implications directly associated with the MOU. Any future projects or activities initiated under the MOU which have financial implications and would need to be considered on their merits. If endorsed by Council, Administration would provide regular reports and updates on the operation and collaborative activities under the MOU.